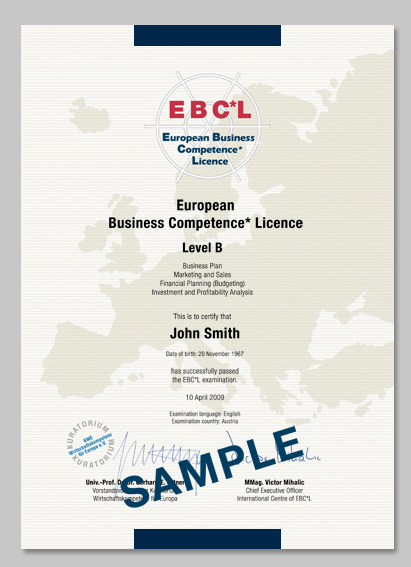 EBC*L Level B – Business planning. Evaluation and analysis of investment projects. Marketing and sales. Acting or potential team managers and team leaders, and specialists who want to be able to prepare, control and evaluate business plans and investment projects. Terminology, structure and tools to prepare a business plan. Analysis of value adding. Analysis of the business environment: PESTEL, STEEP, SWOT, portfolio analysis. Principles and best practice in preparing and defending a business plan and project proposal. Financial planning, budgeting and investment analysis- developing further the competencies from EBC*L Level A. Practical exercises of the budgeting process discussing the elements of the operational and financial budgets. Basic methods for static and dynamic evaluation of investment projects with many examples to reinforce understanding- BEP(break even point method), ROI(return of investment), NPV(net present value), IRR(internal rate of return), Payback Period. Key terminology. Approaches and tools for analysis of market environment. Models to analyse products/ services/ decisions, clients, competitors and to approaches to present own products. Trade terminology when negotiating product sales. Typical activities in the sales pipeline. B2B- and solution- sales. Attendance form- combining 7 full day or 9 evening seminars, 2 of them for revision and preparation for the exam which is in 2 parts. Web- based learning with sequential uploading of study materials every week and on-line consultations when needed. Two attendance seminars at the end to prepare for the exam. Each of the 2 exams should be passed in order to receive a certificate. 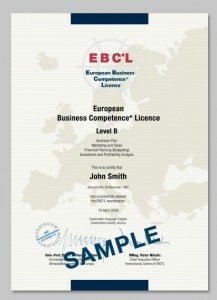 The crtificate EBC*L level B is issued in Austria by the European Kuratorium for business competencies in Paderborn, Germany. Attendance form – Contact us for proposal! Web- based learning – Contact us for proposal! Exam fee – Contact us for proposal!